Say no more to bad habits! 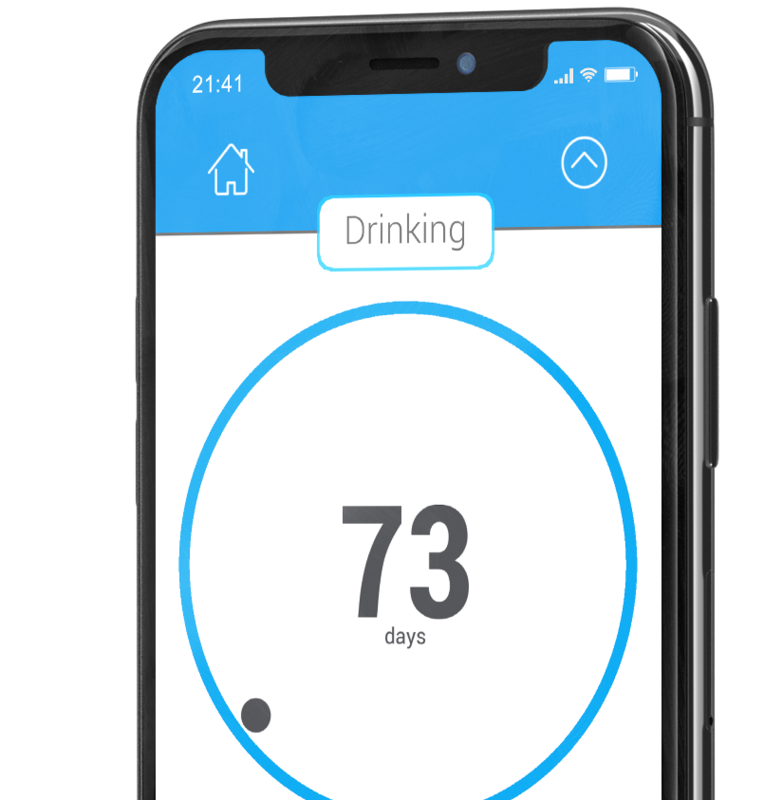 Nomo is the number 1 sobriety tracking app in the AppStore! The coolest part is that I'm not a company. 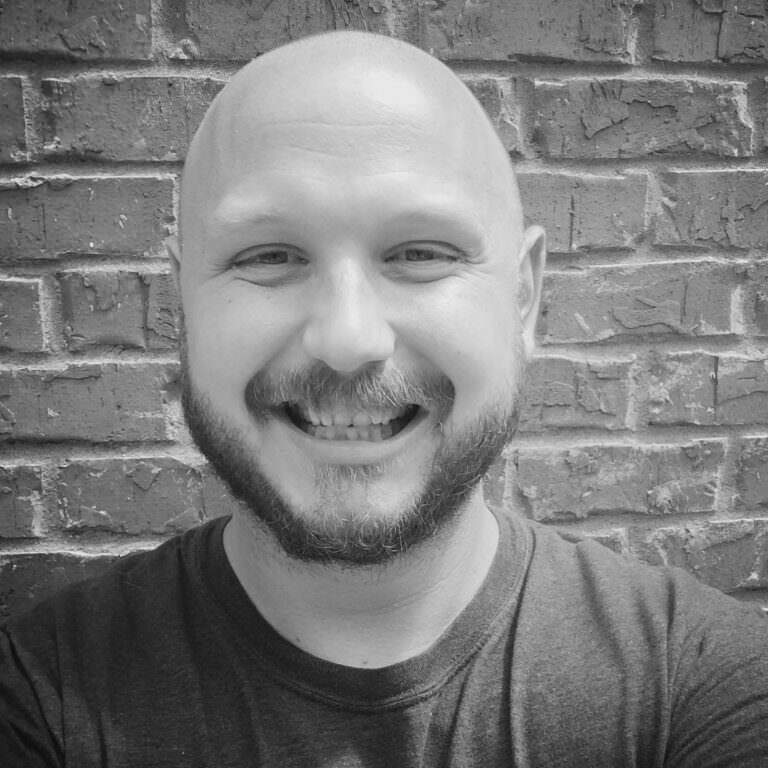 I'm just a guy in recovery who made an app that's helping hundreds of thousands of people all around the world! I would LOVE for Nomo to be a significant part of your recovery! One great way to stay encouraged is to see your progress. Nomo will break down tons of stats like your streaks, how much money you've saved, how many calories you've burned (for alcohol clocks), how much time you've saved, and a ton more! Create a clock for each issue you're working on! Track things like money saved, calories burned (for alcohol clocks), time not wasted, etc! 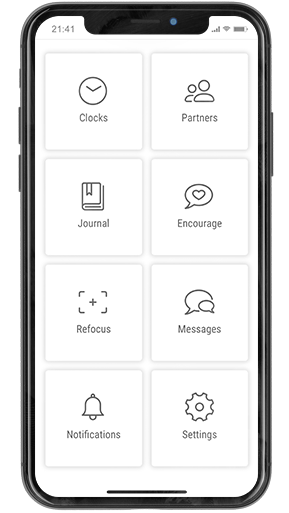 (Optional) Share your clocks with friends, family, accountability partners, sponsors, counselors, etc. You'll earn a new milestone chip for various lengths of sobriety! Checking in saves a timestamps that shows you're actively checking your clock. You can set the name, color, category, sobriety date, and more! Yes and no. Many people just want a simple counter that will show them the number of days that they've been clean and sober. If that's all you want, Nomo is perfect for that! However, if you look under the hood, Nomo is so much more! Everything from an encouragement wall, to accountability partner searching, to mini-exercises to help you refocus! Nomo has been an ongoing project with user-suggested features that get added all the time. I like to say that it's a community built app. I want Nomo to be packed with useful features, but I also want to it be a simple clock. If you just want the clock, awesome! Ignore everything else. Otherwise, the dashboard opens up a ton of helpful tools! If you attend meetings, it's common for everyone in the group to connect with each other in the app. 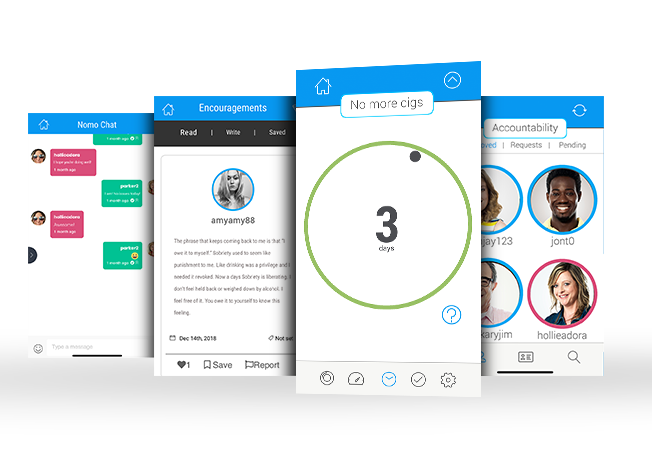 If you don't go to meetings, Nomo can search for accountability partners! Once connected, you can share your clocks and message each others. It's a great way of staying accountable! Journaling is a huge part of recovery. It allows us to get our thoughts out of heads an on to paper... or screens. This is a no-frills, to-the-point journal. Write your thoughts and move on. Journal entries are completely private and a great place for you to vent or celebrate. Sometimes we just need to hear from others. The encourage wall is a place where you can read encouraging words from the community. You can even post them yourself! It's a great way to stay motivated and to motivate others. We all know that feeling... the urge to make a mistake. I created a handful of mini-exercises/games to help you refocus and slow down those impulses. It has everything from breathing exercises to virtual bubble wrap. If you're feeling tempted, take a minute to distract yourself and refocus. Once you've connected with an accountability partner, you'll be able to private message each other within the app. This is perfect for checking in and sending quick words of encouragement. It's also great when you're feeling tempted and need to reach out. I'm not a company. I'm literally just a guy in recovery who created an app that I needed. I'm blown away by how many people have made Nomo a part of their journey. I'm so proud of the community for getting behind Nomo and making suggestions to make it even better. "Why not charge 99 cents and rake in the dough?" is a question I'm asked often. It's 100% a moral thing. So many people won't download an app if they have to pay for it. Even having, "Contains in-app purchases" is a major deterrent for a lot of people. I don't want anything to stand in someone's way of getting help. With that said, I intentionally don't charge for Nomo. "Do you run ads?" is the next obvious question. Yes, I do and I personally hate it. Unfortunately, since I pay for everything out of pocket, the ads are a massive help with offsetting that cost. However, a lot of people don't like ads and I'm completely with them on that one. I set a PayPal link that lets you donate any amount that you feel you can part with and that's worth it. In return, PayPal will forward you to a page where you have to option to disable ads on your account. The amount is completely up to you. I appreciate every penny. If you want ads removed, but you can't afford to donate anything, I completely understand. Just shoot me an email and let me know. The last thing I want is for money to keep someone from using Nomo. Here are a few screenshots from the app! I do not write reviews, BUT for this one I will. I don’t know if it’s the best, nor does it matter, it’s free, convenient, and works. I’ve actually quit or reduced a few bad habits with this app, including alcohol and cigarettes, going on over a year! Try it out fo sure. I love this app. It helps me keep myself in check and also makes me feel good to see how great I'm doing! 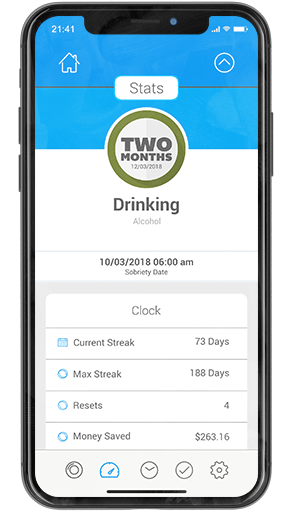 Thanks for making such a great app to keep an easy track of my sobriety! I used this clock when I stopped drinking. Seeing the number of days I’ve gone without drinking helps keep me motivated. The app is easy to use and gives me a sense of pride. First of all thank you for having a free app! God bless you! I love this app because it tracks more than just the day, it shows me the money I wasted too! As of now it’s 202 weeks 😊 thanks again for helping me stay accountable! This app is so fresh looking, customizable and the sobriety reminders are nice. I use this for binge eating recovery. The personal touches from Parker make you feel like someone cares. Made by a recovering addict for recovering addicts. He gets it and it shows in the way this app is. Checked today and have 1.5 years. Was awesome to see it in writing! This app has helped me keep track of my days since I quite drinking. It’s helped me tremendously and I like that it gives me metals. Helps you feel just that much more accomplished. Thank you! So helpful keeping track! The days are passing by fast, I'm glad to be in recovery and doing good for my mind, body, and spirit. To see how much time, money and calories wasted on alcohol is a real inspiration for me. Easy app to use. It’s been quite a year + 4 months + 3 weeks + 4 days! :) I’ve absolutely loved having this app on my phone. Being able to check in at any time gives me an instant feeling of recognition while reminding me of my progress. The ‘money saved’ counter, in particular, is something I keep track of myself, and proudly share with others invested in my recovery. Also the creator of the app seems very sincere and genuine, which makes me love the whole thing even more! A no nonsense, reliable tracker that helps keep your goals clear and in sight. It’s really helped me! Keeps you on track. A great tool for recovery. I really like Nomo. I like that it lets me have more than one clock and enjoy seeing my sobriety in years, months, weeks, days, hours and seconds because it appeals to my OCD tendencies and gives me different perspectives on time. FYI, I’m closing in on 77 million seconds. ;-) I wish there was a way (or, if there is one, it was more obvious) to turn off all sounds. It’s almost been a year and this app has been here every step of the way. I haven’t used every feature it offers but the satisfaction of the monthly chips and encouraging words posted by others fuels the fire to push on. To the designer, Mr. Parker thank you for creating an app that has helped so many people on their road to recovery. Ready to say, "No more"?